Are you interested in achieving Qualified Teacher Status through the Schools Direct Route, being based here at Wednesbury Oak to develop into a potentially outstanding teacher? We offer the opportunity to appropriately qualified graduates to gain their QTS through a one year placement at our outstanding graded primary academy where you will receive quality support from a Professional Mentor and our dedicated and friendly staff team. 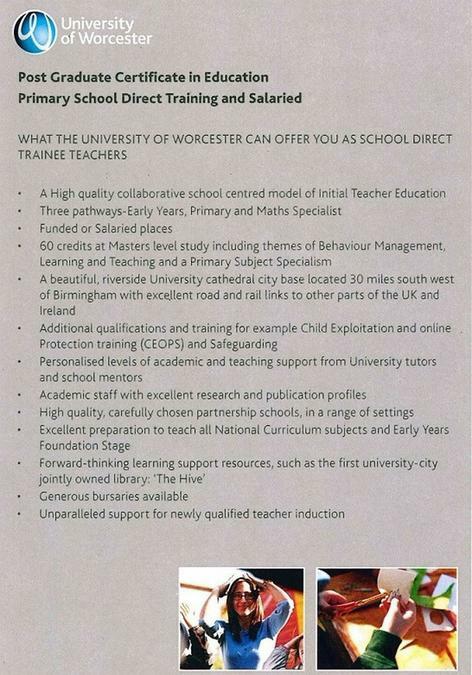 We offer the placement through Worcester University and Barr Beacon School and applications are now open. Apply early to avoid disappointment by clicking on the link below.